B-CC threw everything they had at him, but Chris Moen remained unfazed. If they wanted a slow pace, he would happily run away from them. If they wanted to drop him early with a fast pace, he would gladly play catch up and blow by them in the end. And if they wanted to sit and kick on him, they were as good as dead. There was a time when Moen seemed unbeatable to all of his local competition, but due to bad races during cross country and indoor track, the top runners no longer hold that same sentiment. With the right approach, the giant could be toppled on any given day, and B-CC was out to prove that on Wednesday by pinning three against one in the 800, 1600, and 3200. Moen had not run a race longer than 800 meters in nearly three months, but lined up fresh for the 1600-meter run against Dylan Straughan, Walter Beller-Morales, and Alex Prevost of B-CC. When the gun went off, Moen quickly took the lead and set a fast pace. The three from B-CC kept contact with him for nearly 1400 meters before Straughan drove past him on the outside. This, however, lit a fire under Moen. He attacked the last half of the curve to move back into first place. All four runners furiously kicked down the final straightaway. Moen gained three seconds on the others in the final stretch, finishing in 4:36. The three from B-CC all finished in 4:39. 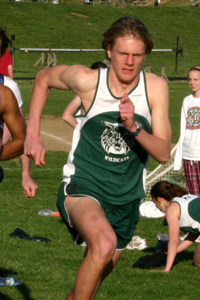 It seemed that Moen was never in contention to win the 3200-meter run, but looks can be deceiving. Kyle Short and Straughan pushed the pace to a 4:55 first 1600 while Moen casually ran in third place about 8 seconds behind them. It wasn't until there were 800 meters to go that Moen began to reel in the leaders. It seemed impossible, but fans looked on as the 50 meter gap rapidly closed in the second-to-last lap. He took the lead with 200 meters to go and gave his opponents a clear view of his furious kick. Short challenged him the best he could, but it was no use. Moen won in 9:52. Short was second in 9:53. As the meet progressed, the B-CC boys were aware that the team scores were close and if their team had any chance of winning, they had to stop Moen in the 800. It was the same three from the 1600-meter race, and Moen again dictated the pace before Straughan pushed it 200 meters in. Moen decided to let him go and sit in the next pack which included Beller-Morales and Prevost. After a lap and a half, all three moved by Straughan as he faded badly. Prevost was a few strides up on Moen coming down the final stretch. Moen pulled up until they were kicking side by side. Prevost appeared to have an edge, but Moen gave a final burst at the line to take the win in 2:04.7. "That guy is ridiculous," Prevost said with a smile after placing second in 2:04.9. "Moen is back," Straughan declared after completing his third race of the day against him. Some would argue that Moen never left. He broke the indoor county and state records in the 800 this winter and in fact did not lose an 800-meter race this winter. But the truly unflappable, unbeatable track giant who would dominate every athlete in every event has not been seen in over a year. The times that he ran on Wednesday were not his personal bests. So if he was gone, was this performance a true testament that he is really back? One thing is for certain: he had a lot of homework this week. As a college-bound senior, he knows that he has four more years to run against great competition and run fast times, but he has to graduate high school first. Just like every other senior, he's got dozens of other things on his mind, a healthy mix of thoughts to go along with his passion for running. He is not fixated on other runners and beating them every time out. He is not pressuring himself with thoughts of running perfectly. He is not consumed by the inner fears of failure and what others will think of him if he doesn't win. He is thinking about his homework. And if he finishes high school on top of the local running scene, it will be a rewarding finish to the impressive career that laid the groundwork for four years of Division I running in college. It's nice to see the "unbeatable" back again! This should be an interesting distance season with Chris, Neal, and Wil running thier best! dont forget about Palmer and Haile. I doubt he will be unbeatable for long. Yeah, but it will still be interesting to see.